Based on the DC Comics character and from the producers of Arrow and The Flash, Supergirl joins the increasingly crowded pantheon of current comic book television series (which those afore-mentioned shows aside, includes other DC based properties Gotham and the forthcoming Legends of Tomorrow) but this time, quite rightly, with a female lead. An all too brief prologue explains Kara Zor-El’s arrival on Earth (having escaped from the destruction of her home planet, Krypton) which due to an excursion into the ‘Phantom Zone’ occurs twenty four years after her infant cousin, Kal-El landed. With Kal-El having established himself as the titular Man of Steel himself, Superman, he leaves Kara in the care of the Danvers family to allow her to find her own path. Fast forward to present day in National City and we see Kara Danvers (Melissa Benoist) struggling to forge a meaningful career at the Tribune newspaper headed up by the steely and cold hearted Cat Grant (a rather ‘catty’ turn from Calista Flockhart) and where Kara shares her woes and angsts with co-worker and best friend Winn (Jeremy Jordan). Frustrated with the status quo, when her adoptive sister Alex (Chyler Leigh) is involved in a plane accident, Kara decides to embrace who she really is and utilise her abilities to help the innocent. Melissa Benoist (formerly of Glee) is a likeable lead, deft at switching between both sides of her character, from displaying the happy-go-lucky bumbling unease as the bespectacled Kara Danvers to the strong willed determinations of the Girl of Steel (which Grant decides to name ‘Supergirl’, much to the annoyance of Kara who was hoping for something more along the lines of Superwoman). She shares decent chemistry with her co-stars, with plenty of fun exchanges with Flockhart and Jordan and positive family ties with sister Alex (unfortunately we only get a glimpse of adoptive parents Jeremiah and Eliza Danvers – played by nineties TV Superman Dean Cain and one-time silver screen Supergirl Helen Slater, respectively). The pilot of Supergirl also introduces us to another major character in the form of Superman’s best pal Jimmy – now taking himself more seriously as James – Olsen with a restrained yet promising and appropriately modern performance from Mehcad Brooks. The Supergirl pilot’s key action sequence in which Kara leaps up, up and away(!) to save a crashing aeroplane is not entirely original, yet proves suitably tense and exhilarating (bolstered by some outstanding visual effects) and provides an event in which the Girl of Steel can be revealed to the world. In contrast, the climactic showdown with villain Vartox (Owain Yeoman) comes off a little less refined and somewhat clunky…but I guess you can’t have it all? Overall, the pilot for Supergirl is solidly entertaining with a tone largely reminiscent of the Christopher Reeve Superman films. Whilst there are elements that will mainly appeal to a young adult demographic there’s still plenty of action and mythology to satisfy comic book fans. There’s some necessary tip-toeing around the issue of Superman’s existence which despite the continuous references to “him”/”he” becoming a little tiresome, is generally well handled and the release of superpowered criminals from the Phantom Zone could prove either a blessing or a curse (remember those formulaic villain of the week episodes in the early days of Smallville?) but with a couple of neat twists and a likeable lead (and no less a strong female character for younger viewers to aspire to) there’s a good chance that Supergirl will fly. The bottom line: The pilot for Supergirl shows promise, despite some potentially formulaic elements there’s plenty of fun, action and comic book mythology to satisfy a varied audience. Supergirl airs in the UK Thursday evenings on Sky One. US viewers can catch it on CBS. What did you think of the Supergirl pilot? Share your thoughts below! 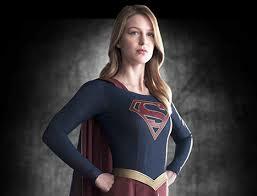 Melissa Benoist makes for a likeable lead in the new CBS series ‘Supergirl’. Image belongs: CBS/DC Comics. Marvel’s All-New, All-Different initiative is now underway and the comic book publisher (and overall entertainment behemoth) have teamed up the successfully tried and tested Ultimate Spider-Man creative team of Brian Michael Bendis and David Marquez to lead the charge for what is intended to be their flagship title, Invincible Iron Man. With so many corporate minded resets/relaunches within the comic book industry these days, it’s hard for even a writer of Bendis’ calibre to deliver a brand new first issue of a title that feels fresh and innovative – especially when dealing with a character that has now been around for over fifty years. Despite some feeling of familiarity, Bendis and Marquez deliver an entertaining and tantalising (re)launch issue that brings readers into a post-Secret Wars (Marvel’s multiverse destroying event series which doesn’t actually conclude until December) world where it’s more or less a case of business as usual. Time is taken to reacquaint readers with Tony Stark as he builds his newest version of the Iron Man armour, established readers will have seen this many times before across numerous Iron Man runs yet with new readers in mind it’s also necessary and at least there’s no elaborate retelling of the modern age Iron Man origin story (see Iron Man: Extremis by Warren Ellis and Adi Granov). Since Robert Downey Jr’s lighter interpretation of Tony Stark won over the film going masses, Marvel have sought to tweak the persona of the comic book character to match that of his cinematic counterpart. It’s something that’s been difficult to achieve without Stark coming across as too much an out and out a-hole and Bendis proves more successful here than Kieron Gillen did during his pre-Secret Wars tenure. Bendis continuously straddles – and spontaneously hops over – the line between the serious, as Stark contemplates futurist ideals, and the humorous, where there’s playful exchanges with holo-A.I. FRIDAY, to decent effect and is sure to build a version of Marvel’s Howard Hughes-inspired industrialist billionaire that will appeal to long term fans and the masses alike. David Marquez provides some great visuals, his action scenes have a big budget widescreen feel to them (with one particular sequence reminiscent of classic Anime feature film Ghost in the Shell) whilst delivering detailed surroundings and expressive characters. Most significantly though, Marquez unveils a pleasing new Iron Man suit that is sleek, angular and modern whilst still incorporating the basic design elements of classic armours. We’re yet to see a full demonstration of the enticing ‘morph’ aspect of the new suit’s design which will allow it to incorporate elements of previous Iron Man armours on command, but this will surely come into play in subsequent issues. Despite those afore-mentioned elements of familiarity, with an intriguing new threat from (spoiler) iconic Iron Man villain Madame Masque and a tantalising finale there’s plenty to be excited about for the future of Iron Man. 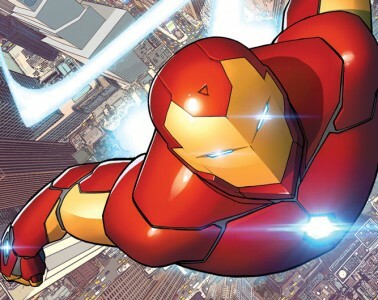 The bottom line: With snappy dialogue from Brian Michael Bendis and solid visual storytelling provided by artist David Marquez, Invincible Iron Man is off to a promising, if at times familiar, start. Invincible Iron Man #1 is published by Marvel Comics and is available in print and digital formats now. Cover art for Marvel Comics’ ‘Invincible Iron Man’ #1 by David Marquez. Image belongs: Marvel Comics.